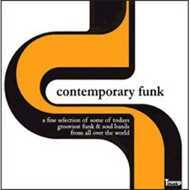 The funk on this compilation is contemporary but the message of funk is as old as humanity itself. funk as tramp records sees it is a vibrant and viable music that was born from a transformative period in american history - the sound of the growing pains of a young country. 'contemporary funk' gathers inspired bands from today whose hearts still beat for funk's timeless truth, and connects them with this rich legacy of american music. today, the rhythm and earnestness of true funk can be found in all corners of the world. and this compilation is evidence that the innocence and purity of the original message remains strong. affectation and phoniness can't seem to take hold in funk as long as the unenlightened or uninitiated players aren't trying to wah-wah their way through one-dimensional cartoon-like clichés. afro wigs and 'booty' references only help to reinforce racist stereotypes and obstruct funk from realizing it's true potential as an uplifting music for all the people of the world. 'contemporary funk' assembles bands which hearts beat for the original, raw soul sound they want to keep alive in its original form. the sugarman 3, whose former musicians are now members of the famous dap-kings (of sharon jones fame) are included just as will holland (quantic soul orchestra). also finlands no.1 funk band, the soul investigators (of nicole willis fame) are to be found within some more heavy acts. however, the aim was to focus on new bands on the scene such as derobert & the half-truths, the funk revolution or the ben martin trio, to name a few. original funk music lives on in the 21rst century - and ‚contemporary funk' is a great proof for that.